>Streets in this part of Fillydelphia were not completely empty. 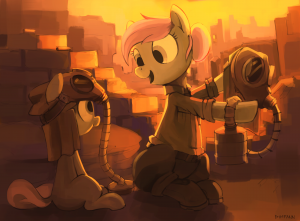 Just like before, ponies who were fearing the enemy or the warfare itself left their homes or living places and moved deeper into the city to hide. >They were making your search a bit easier. Even if a certain citizen didn't know the area too well, he or she could always ask a friend, host, family member living here or just another pedestrian and get directions for you. >Local library was rather large building, made to look like it was built in ancient times, but cheap fake marble, beton, or ferroconcrete were ruining the impression. >It was not in a very good state, too. Front door was still in place, but opened. >When you enteredd inside, a foul stench of wet ash, mould and something rotting made you wish you could leave and never return here again. >Big hole was letting some light and snow into the hall. A pile of rubble was sitting under it. >There was one coridor to the right, leading to the toilets, cloakroom and expo room. >On the other side there was small cafeteria, preasumably made for the visitors so they could enjoy a fine drink while taking a break from reading. >In front of you there were high stairs. They looked disturbingly fragile. You noticed something darker than the surface it was resting on, long and cylindrical laying on three steps. >There was a good amount of bookshelfs around, some of them covered in snow, some under the rubble or ruined by debris flying around when the place was shelled. Sometimes there was a sign with one letter written on it above a bookshelf or a place where it was supposed to be. >Proceed upwards or try to look down here?